Easy access to your business checking account is important as a business owner. With a Royal Bank Visa® Business debit card, you can make purchases right from your account without the hassle of writing a check. 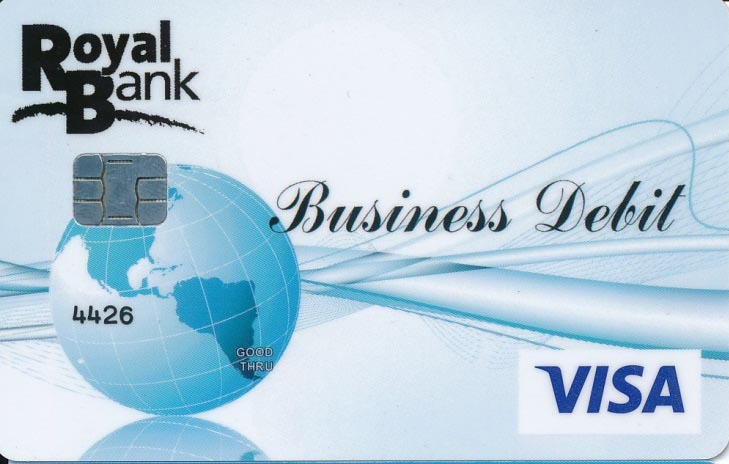 A business debit card works much like a credit card. Simply swipe, sign and retain a receipt for your records. Royal Bank Visa® debit cards are accepted at all merchants that accept Visa® and can be used to access cash at ATMs. As an added bonus, you can choose your debit card graphics from Royal Bank's available designs. To help mitigate fraud, Royal Bank debit cards cannot be used for international purchases online. If you haven't already, you will soon receive your new Royal Bank EMV Business Debit Card, also commonly known as a "smart" card or "chip" card. A Royal Bank EMV Business Debit Card provides added security and peace of mind when using your debit card. Click here to view a short video on what to expect and what makes these cards more secure! How are EMV cards more secure? EMV cards are embedded with a visible microchip that essentially scrambles each point-of-sale transaction, so each transaction has a unique identifier. This makes it nearly impossible for a criminal to use transaction information from a merchant for fraudulent activity. Simply insert your EMV debit card into the EMV card terminal, enter your PIN or sign for the transaction and remove your card when the terminal indicates that the transaction is complete. Yes, you can still swipe your card at the payment terminal; however, if the payment terminal you're using is EMV ready, it will prompt you to insert your card in the EMV card slot. How do I learn more about switching to an EMV card reader? Prewards are digital coupons that are directly linked to your Royal Bank Visa® debit card. You can save money at participating merchants and local retailers simply by using your card! There are no paper coupons to clip or points to redeem. Simply pay for your items at a participating retailer with your debit card. The credits will appear on your next monthly bank statement. To start using Prewards, go to https://royl.myprewards.com and provide your email address, debit card information and communication preferences. With this information, we will be able to send you the most current Prewards offers and communicate with you based on your indicated preferences. Once you've activated your Prewards account, you can log in to view your available offers anytime, anywhere. You can also opt-in to receive email alerts each time you receive new Preward offers. If your Royal Bank Visa® Business debit card has been lost or stolen, please contact Royal Bank during regular business hours at 800.873.1406. If you discover your card is lost or stolen after regular business hours, please contact the Lost & Stolen Service Center at 800.528.2273 and follow the voice prompts to deactivate your card. Please contact Royal Bank the following business day so that your checking account can be monitored and a new debit card can be ordered. Your debit card transactions are continually monitored for purchases outside your normal purchasing patterns, unusual timeframes and geographical locations or purchase patterns that are consistent with previously identified fraudulent activity trends. With all fraud, time is of the essence. That's why our payment processing company, Vantiv, offers a convenient & free Card Alert Notification Service. You will receive a text message asking you to confirm whether a suspicious transaction was authorized. All you need to do to sign up is make sure we have your cell phone number! Text messages will arrive with a five digit code (33748), the name "Royal Bank", dollar amount of the transaction, and the merchant name. If you authorized the transaction, reply "yes". You will receive a confirmation text and can continue using your debit card. If you did not authorize the transaction, reply "no". You will receive a confirmation text and an immediate call from a fraud specialist. Please answer this important call. As with any form of electronic communication, (phone, email, text) do not reply to the text message with any personal or confidential card information. If you would like to opt out of receiving these messages by text, you may reply "stop" to indicate this preference. Gift cards are the perfect solution for people who want the convenience of a card with the simplicity of cash and they make great gifts! Gift cards can be loaded with amounts ranging from $10 to $500 and can be used wherever Visa® is accepted, including online and over the telephone. Prior to using your card, you should register by calling 800.486.0292. Registering your card also allows you to activate text and email alerts to notify you when your card balance is low. You can also create a free online account at www.convenientcards.com. For customer service support or to report a lost or stolen card, call 800.486.0292 and have your gift card number available. It is recommended that you keep a record of your gift card numbers in the event the card is lost/stolen/damaged. Gift cards cannot be used to withdraw cash.